Only the early Sweet 16's came with wrist tags. The later dolls and the exclusive Montgomery Ward mail order doll did not. In 1974 the Sweet 16 Barbie Doll (stock number 7796) was released to commemorate Barbie’s 16th birthday that was coming up on March 9, 1975. For only two years was this pretty blonde Barbie, with a longer blonde style shag haircut and pretty blue eyes with painted on eyelashes, on store shelves. 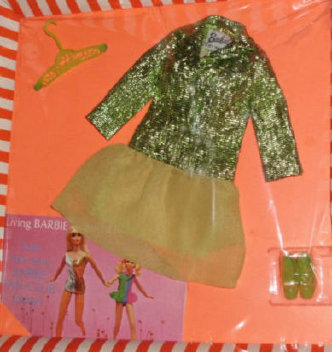 The first dolls available were bundled in a special promotional packaging that included an extra set of clothing. Barbie came dressed in a long pink dotted Swiss dress, wore white square closed-toe shoes, and carried a pink make-up compact case. Included in the box was a brush, comb, 2 applicators ‘n sponges, 4 barrettes, and 2 label sheets. Her additional promotional ensemble consisted of longer style jean shorts and a yellow tank top with a large number 16 printed on the front of the shirt. She is marked © 1966 Mattel, Inc. U.S. & Foreign Patented Other Pat's. Pending Made in Taiwan. Only the early promotional and regular packaged Sweet 16's came with wrist tags. The later dolls did not have them. This girly girl came with cosmetics. By pressing a label on to a barrette, comb, or hairbrush, a sweet fragrance would be released onto the item and could either be placed or brushed into her hair. By using the sponge over the blusher you could add color to her cheeks, which easily washed off with soap and water. Girls who purchased this doll could also be included in her birthday party by completing the “Barbie Surprise Birthday Present” coupon on the back of the box by May 1st, 1975. In return they would receive a surprise present with special offers. There was also a mail order version available from Montgomery Ward. This doll came in a brown mailing box marked 7796 with her correct accessories, but she did not wear a wrist tag. white square close-toe shoes, yellow comb and brush, pressing labels, pink compact which has the two blushers colors in the bottom portion of the compact when opened. In the lid there are two sponges for the applicators (not shown).